For almost 20 years now, the Mission: Impossible series has distinguished itself by involving various high-profile directors for each entry, all of whom bring their own unique set of sensibilities to the table. From the non-stop cliffhanger approach of JJ Abrams to the cartoon-inspired setpieces of Brad Bird, each film feels like a director’s self-contained argument on how to create the perfect action movie. Christopher McQuarrie, of Usual Suspects fame, steps up for the fifth entry in the franchise and makes the strongest case yet by creating the most outrageously entertaining and consistently enjoyable M:I movie in the series. We rejoin IMF agent Ethan Hunt (Tom Cruise) as he finds himself at odds with the Syndicate, a shadow organization comprised of ex-operatives from intelligence divisions across the world. One of its members, Ilsa Faust (newcomer Rebecca Ferguson), is a perpetually elusive femme fatale type who forms a makeshift alliance with Hunt based on mutual interests. Along with returning IMF recruits Benji (Simon Pegg) and Luther (Ving Rhames), Hunt must stay one step ahead of the Syndicate’s head Solomon Lane (Sean Harris) as he attempts to create a new world order, one violent act at a time. As is typical, the plot is an elaborate excuse on which to hang extended action setpieces that move the story along at a reasonable pace. While there’s nothing in this movie that quite equals the masterful, series-best Burj Khalifa sequence of its predecessor, it does contain about 4 or 5 exquisitely well-crafted action scenes that come very close to besting it. 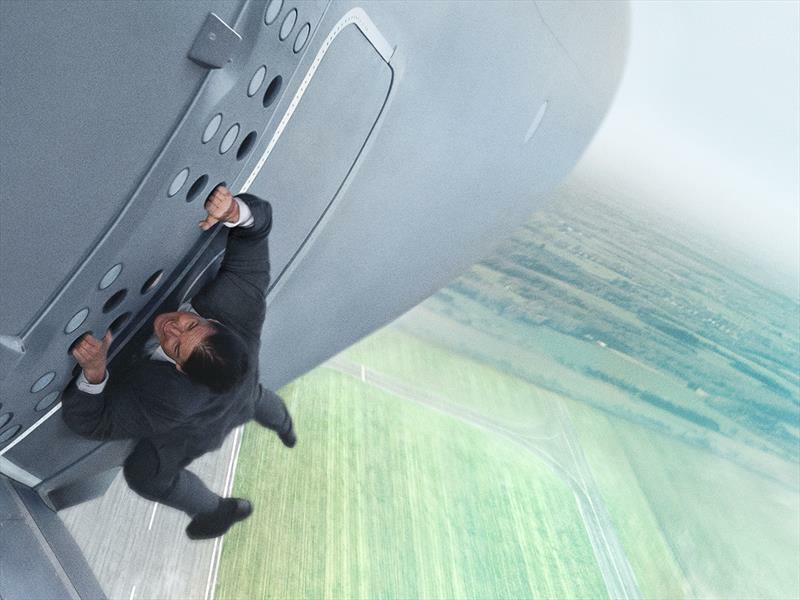 Advertising of the film has focused on the opening sequence, which literally has its star Tom Cruise hanging off the side of an airplane mid-flight, but the most pleasant surprise is that none of the other sequences feel like a letdown by comparison. It should go without saying at this point that Tom Cruise gives everything that he has to these movies. At 53, he’s pulling off stunt work that actors half of his age would be proud to accomplish. His dedication and commitment to the increasingly ludicrous demands of the M:I movies is not only admirable but it also goes a long way in selling his performances each time out. When we know that it’s truly Cruise holding his breath underwater for minutes at a time or careening through highway traffic helmet-less at top speeds on a motorcycle, it creates a thrilling sense of peril that just can’t be matched. I should note that I also saw this film in both digital IMAX and “true” 70 mm IMAX formats and I would highly encourage readers to seek it out in either form. Not only is the visual experience vastly expanded but the sonic quality is much more sophisticated and powerful than what the common movie theater offers. No matter which way you choose to see it, Mission: Impossible – Rogue Nation is top-notch entertainment, proof that an action movie made at the highest level can be a true work of art.